Jayce Paulseth notched a hat trick and blew up for seven points (3g-4a) as the Duluth East Grey Hounds handled Duluth Central on opening night of the Heritage Arena in Duluth Tuesday night. Max Tardy also tallied a hat trick and added an assist while Joe Arbour had three assists in the 11-0 victory. The Hounds had 8 players notch multiple point efforts. The Hill Murray Pioneers opened their season with an eye popping 6-0 victory over the Burnsville Blaze. For the Blaze it marked their second loss in as many games as they fell 4-2 to Bloomington Jefferson on Saturday. The Pioneers scored two goals in each period and scored a pair of goals :29 apart at the 14 minute mark of the first period as Isaac Kohls and Nick Widing put their team on the board. Tyler Zepeda and Ryan Holler tallied in the second. Zepeda scored his off the opening faceoff for the all important three goal lead early in the second period. Paul Prescott and Holler scored in the third to close out the scoring. The Pioneers outshot Burnsville 42-19 and displayed why they are among the elite in the league. Burnsville travels to Braemar Arena to take on the Edina Hornets on Thursday while the Pioneers are off until Saturday when they too travel to Braemar to face the Hornets in a rematch of the State Final. Danny Mattson notched three assists to lead the Stars to their season opening victory over Red Wing in Missota Conference action. John Haeg had a goal and assist while Connor Reilly scored a pair of goals in the win. Goalie Tommy Burke was steady stopping 25 of 26 shots. Adam Knochenmus and Shane Ohmdal each had a goal and assist to cap off two point nights in leading the Rams past the Theif River/Goodridge. Tyler Landman also scored a in the first period to give the Rams a 2-0 lead. Both Roseau goals came within :57 as they created some breathing room. It got tense as the Otters tallied at 4:56 as Lucas Dillon gave his team new life. 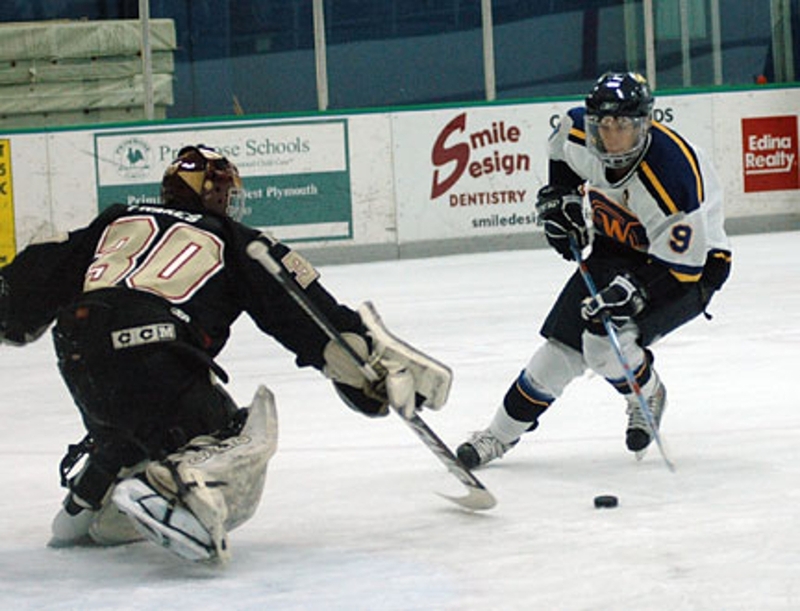 It wasn't until Ohmdal scored on the empty net that the Rams were able to caputure the home opener. The Eagles utilized 6 different goal scorers enroute to the 8-2 route over the Eagan Wildcats. Mike Erickson had a three point night to lead his team (1g-2a-3pts) while Kyle Rau started his high school career off with a bang scoring two goals. Nick Leddy had a goal and an assist while Jordan Hoffman notche a pair of goals for the Eagles. Trent Casper faced 41 Eagle shots in the onslaught. Archie Skallbeck scored an overtime goal with 1:19 showing on the clock to propel the Royals past the Polars in non conference action at the Hopkins Pavillion. After Adam Slagle gave the Polars the 2-1 lead with a pair of goals, the Royals responded with two of their own in the third as Eric Kiihn and Jon Groom scored, giving the Royals the 3-2 lead. Ben Hellquist tied the game at three to send it into overtime, setting up the Skallbeck heriocs. Assisting on his goal was Travis Boyd who also scored the game's first goal. Peter Toy was outstanding in goal making 39 saves for the Polars while his coutnerpart, Alex Fons kicked aside 33 in the winning effort. The Bloomington Jefferson Jaguars erupted for 6 unanswered goals in the third period to cruise by the Rosemount Irish in Lake Conference action. For the game, Jefferson wore down the Irish as they outshot them 42-14. Jefferson's had four players figure in the final outcome with two poinst each as Joe Faust (2a), Caleb Herbert (1g-1a-2pts), Tyler Dietzler (2g), and Jeffrey Pauluk (2a) led the way. After trailing 1-0 after two periods, the Apple Valley Eagles responded with a pair of third period unassisted goals. The first was by Derek Smith at 1:32. They Eagles took the lead at 13:34 of the thrid on Chris Fischers unassisted goal. An empty net goal by A.J. Michaelson sewed it up for Apple Valley in the always intriguing crosstown Lake Conference rivalry. Mariucci Conference's Moorhead Spuds came up with a 2-2 tie against Fargo South in inter-state action. After trailing 2-0 to end the first period, the Spuds battled through and received timely goals by Nic Oxton at :37 of the second period and Kyle Kraemer at 1:17 of the third in a rugged game played in Fargo. Jesse Nemgar scored at 4:01 of overtime as Bemidji defeated East Grand Forks Tuesday night by a score of 3-2. In a back and forth affair that saw EGF take the first period intermission lead after Zach Srnsky scored at 7:08. Kevin Larson tied it on the powerplay for Bemidji at 3:33 of the second period only to see jake Useldinger give East Grand Forks the lead again at 4:46. It would be the last lead they would enjoy as Lucas Phillips tied it again, this time at 2 moving on to the third period setting up Nemgar's heroics who finished with a goal and an assist. Teammate Kevin Larson also added a goal and an assist for Bemidji. Srnsky and Useldinger each were good for a goal and an assist for East Grand Forks. The Rochester Century Panters upended Tartan by a score of 6-3 and were led by Cory Kautz hat trick. Cory Birkestrand had a goal and an assist in the win. After the teams exchanged goals in the first and second periods, it was a three goal outburst led by two of Kautz goals and a Connor Fauple goal that was the difference. Tartan was afforded 10 powerplays and converted on 2 while the Panthers we 2-6 with the man advantage. It was another tight match up as the Iron Range Conference's Grand Rapids Thunder Hawks and the Lake Superior Conference's CEC Lumberjacks duked it out to a 4-4 tie in Cloquet. John Skrbec had a goal and two assists while Patrick Moore added a goal and assist for the Hawks who needed to tally a pair of third period goals to force overtime. Skrbec's goal with 1:21 capped a furious comeback for the Thunderhawks. CEC's Blake Abrahamson scored a pair of goals while Colton Roy had two assists.